It's Helen here! I know I haven't posted many reviews lately. My work and stuff has been super busy. My daughter's been doing all the writings but I will try and share more reviews. 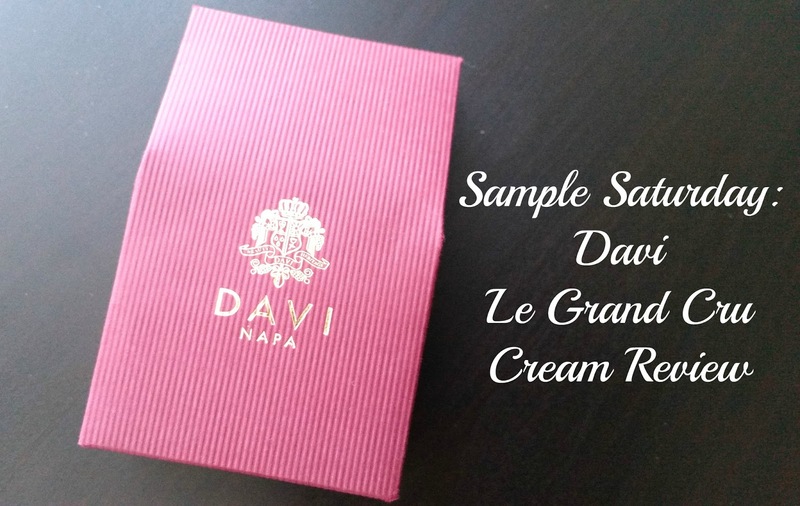 Today's Sample Saturday review is for the Davi Le Grand Cru Cream. This came in one of the first Memeboxes my daughter purchased, the Jackpot box. I was interested in trying this cream out because the full size of this is a luxurious product and it promises to help reverse the signs of aging. That is totally in my alley. Since this deluxe sample is rather small, I only got about 5 days of uses out of it, so this is more going to be a mini review than a comprehensive review. 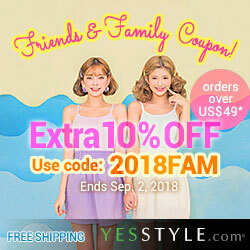 I hope you'll enjoy reading and let's get to it! Product Description: An ultra luxurious cream formulated with DAVI's exclusive Phyto-Meritage micro-encapsulated formula. It contains active nutrient rich ingredients that has the power to transform the skin by reducing fine lines and wrinkles while adding firmness. The cream also moisturizes the skin to rejuvenate and renew it while soothing the skin and adding radiance. To Use: Warm a small amount of the cream between your fingertips for a few seconds then smooth the cream gently onto the face and neck. Ingredients: Aqua, butyrospermum parkii (shea butter), glycerin, glyceryl stearate, cetearyl glucoside, cetearyl alcohol, dicaprylyl carbonate, dicaprylyl ether, simmondsia chinensis (jojoba) seed oil, octyldodecanol, dimethicon, tocopheryl acetate, myristyl myristate, caprylic/capric triglyceride, glycine soja (soybean) oil, vaccinium myrtillus seed oil, tocopherol, bisabolol, acacia senegal gum, vaccinium myrtillus fruit extract, rubus idaeus (raspberry) seed oil, wine extract, rosmarinus officinalis (rosemary) leaf extract, olea europaea (olive) leaf extract, ceratonia siliqua gum, vitis vinifera (grape) leaf extract, ribes nigrum (black currant) seed oil, camellia sinensis leaf extract, allantoin, hamamelis virginiana (which hazel)bark/leaf/twig extract, panax ginseng root extract, butylene glycol, capryloyl glycine, sarcosine, cinnamonum zeylanicum bark extract, carbomer, disodium edta, fragrance (parfum), phenoxyethanol, methylparaben, butylparaben, ethylparaben, propylparaben, isobutylparaben, yellow #5 (CI 19140), red #4 (CI 14700), red #33 (CI 17200), blue #1 (CI 42090), red #40 (CI 16035), butylphenyl methylpropional, geraniol hexyl cinnamal, limonene, linalool. Note: There are a couple of acne triggers and irritants in the ingredient list. Notable, myristyl myristate has an acne trigger of 5 and there are 6 paraben (preservatives) in the product as well. Cream inside the container, it looks kind of like the butter you get at a restaurant. Packaging: To describe it in one word, luxurious. The full size packaging looks even more luxurious. Scent: Herbal scents with hints of citrus. Color: A cream white color. Texture: The texture is a bit odd. When I first touch the cream, it felt hard. Like when you first take butter out of the fridge. However, after taking out a bit and working it between my fingers like the instruction suggests, it becomes softer and more spreadable. My Thoughts: When I first opened the container, I thought the cream looked like butter. Like the kind you get at restaurants with the bread before your meal. I was surprised to find that when I touched it, it felt hard too. Like how butter feels when it was just taken out of the fridge. That emphasized the feeling of butter. After working the cream between my fingers as the instruction suggests, the hard butter like cream started to become a bit soft and buttery. I guess this cream has a thing for butter, or maybe it's me. When applied on the face and neck, the cream can leave an oily feeling for a bit and that feeling disappears once it's fully absorbed. A little goes a long way for this cream. Which is why it lasted me longer than expected. It felt very soothing on my skin and moisturizing as well. I wasn't too fond of the initial oily feeling. However, once the product is fully absorbed and the oily feeling disappeares it was fine. As for the promised wrinkles and fine lines care, I didn't notice any difference. Although, it could have been because I only got to use the cream for 5 days. Maybe there will be better results with a longer period of use. However, for a cream this expensive, it should have had some effects. I also didn't notice much firmness either. I was most surprised to find that this brand was created through a joint venture of a California company and LG in Korea. 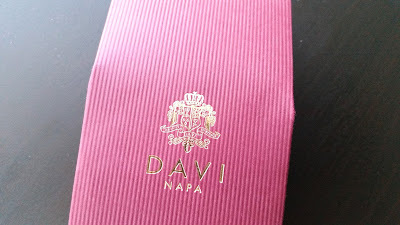 This brand was created by Robert Mondavi, who is known for his winery in Nappa Valley. This was a surprise find because I have had his wines and had no idea he had a skincare line too, until now. Anyways, Mondavi's DAVI skincare line signed a 10 year exclusive licensing agreement with LG and became part of the LGHH (LG Household and Healthcare) group in 2012. 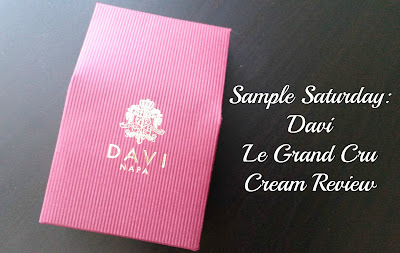 The products from DAVI's lines were developed in collaboration with LGHH's research and development team as well. I have to say, his skincare line and these products are quite expensive. The full size of this Le Grand Cru Cream cost $185. The exclusive Phyto-Meritage formula seems to be a major factor to its expensive price. Meritage is an anti-aging antioxidant complex. It's a unique blend of grapes and fermented wine extracts, as well as ingredients like green tea, raspberry, black currant, bilberry, rosemary and olive leaf extracts. 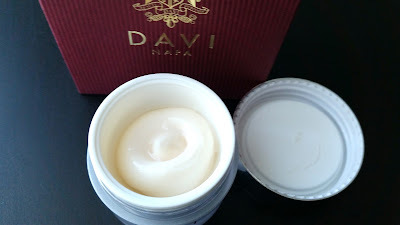 According to DAVI's website, this complex is created through a double fermentation process and it's preserved in the formula until the moment it's applied to the skin. 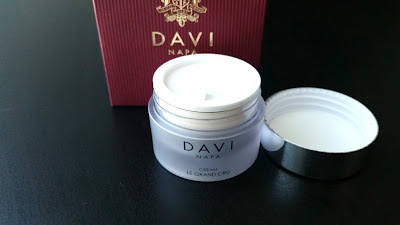 Final Thoughts: I expected more from this Le Grand Cru cream that has a heavy price tag. Even if I only got to use it for a short period, due to it being a deluxe sample, it should have still shown some of its wrinkle care/fine lines and firming care. Unfortunately, I didn't notice any changes which was disappointing. The cream did feel moisturizing and soothing when applied. I was not fond of the initial oily feeling it has once applied. However, as I mentioned before, once the cream absorbs into the skin that feeling disappears. Would I purchase the full size in the future? Probably not. While this cream is moisturizing and soothing, it doesn't justify its heavy price tag. 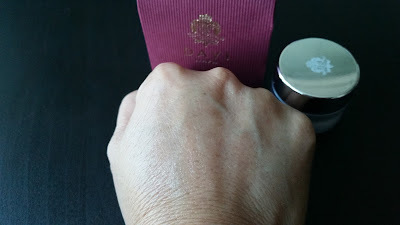 The lack of wrinkle care/ fine lines care and firming care it promises was also disappointing. Do I think this is worth trying? Not really. If you have a lot of money to spend and don't mind a costly cream, then sure. If you have a limited budget, giving this a miss is okay. You won't miss much because if this is a miracle cream it would be all over the news now.